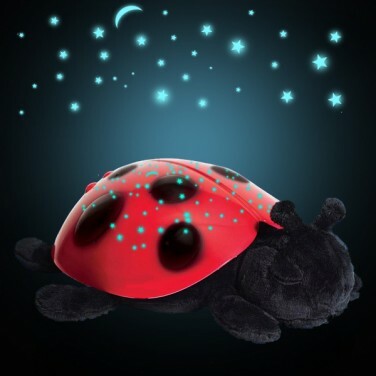 A charming bedtime friend, press the button on this soft plush ladybird and it will project colourful star constellations all over walls and ceilings. 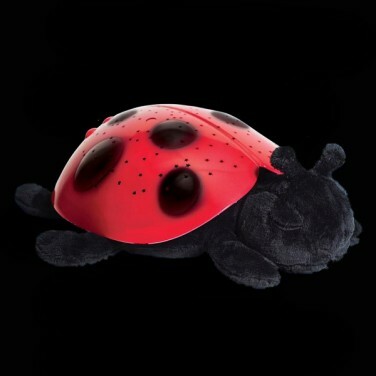 Powered by three AAA batteries, Twilight Lady-bug is a gorgeous soft toy that will keep you company and, with a push of a button, will light up in your choice of red, green or blue coloured light and project star constellations around walls and ceilings as well as keeping you comforted with a glowing night-light shell. Educational and fun this lovely night light projects random stars with seven real constellations including Leo the lion and Pisces the fish which are mapped out on the star guide included. Float away in peaceful slumber under beautiful starry night sky.